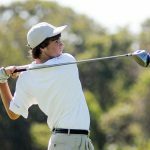 The Martha's Vineyard Regional High School golf team was the first to play a varsity contest in the new school year and got the fall sports season off to a good start with a 249-271 win over the Nauset Warriors, Friday afternoon at the Edgartown Golf Club. 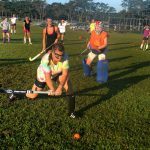 At the first light of day for the past week, students have returned to the athletic fields at Martha's Vineyard Regional High School to prepare for the upcoming fall season. 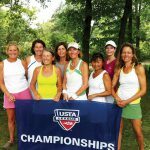 Four Island tennis players are heading to the women's Nationals after winning the New England Championships in Springfield last weekend. 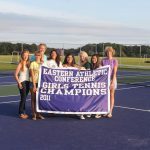 The Martha's Vineyard Regional High School girls tennis team celebrated its first-ever Eastern Athletic Conference championship, in a small ceremony, Friday at the MVRHS tennis courts. 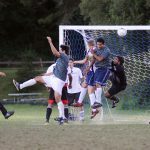 Shirley's Hardware and Sports Haven hooked up in a marathon Vineyard Football Association Gilbert/Hammond cup final at Veterans Park, Tuesday night. 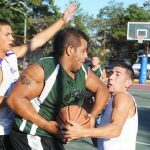 BrantAsil will meet Mopeds Are Dangerous in the Oak Bluffs Summer League Basketball championship game tonight, August 18, at 7:30 pm at Niantic Park. Several hundred people turned out for the $20-a-head fundraiser to benefit the Island's ice rink. 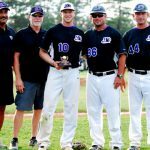 The Futures Collegiate Baseball League named Martha's Vineyard Sharks shortstop Robbie Zinsmeister as the league's most valuable player in a ceremony mid-way through the Sharks' season finale against the Torrington Titans, Wednesday afternoon at Vineyard Baseball Park in Oak Bluffs. 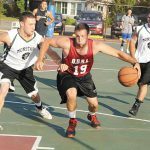 Four games were scheduled, but only two were completed in a rain-shortened Oak Bluffs Summer League basketball slate, Tuesday night at Niantic Park. 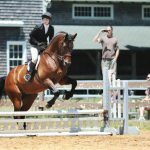 The Martha's Vineyard Horse Council hunter show took place at the Agricultural Fairgrounds in West Tisbury on Sunday. The Martha's Vineyard Sharks still remain tied for first place in the Futures Collegiate Baseball League standings with an 11-7 record. Martha's Vineyard sent two boys travel soccer teams to the Massachusetts Tournament of Champions in Lancaster last weekend. 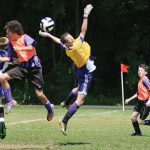 Both Martha's Vineyard boys travel soccer teams won their opening matches at the Massachusetts Tournament of Champions, in Lancaster, Friday afternoon. State U-18 Tournament of Champions final: Brockton 3, MVUnited 0. Two Martha's Vineyard boys soccer teams are headed for state tourney. The Martha's Vineyard Sharks suffered their first defeat of the young debut season, dropping a 4-2 decision to the Nashua Silver Knights, Friday at Vineyard Baseball Park.